Police continue to investigate a hit-and-run crash that left two kids injured in San Jose. Damian Trujillo reports. 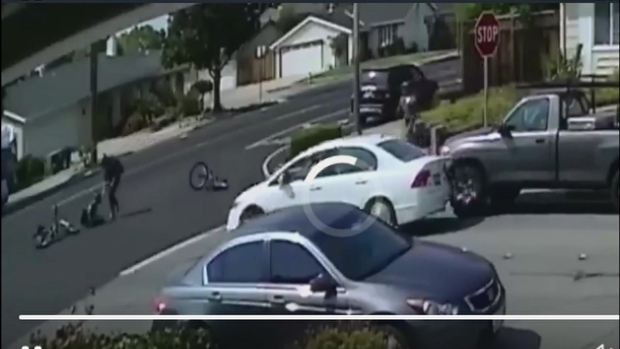 Police on Monday continued to investigate a hit-and-run crash that left two kids injured in San Jose last week. The incident was reported just after 3 p.m. on Aug. 27 on El Molina Way and Cottle Road. Police said a 12-year-old girl and a 13-year-old boy were riding their bicycles in the area when a white, four-door Honda Civic failed to stop at a stop sign and collided into both of them, police said. The driver did not stop to check on the kids, according to police. Both kids were wearing bicycle helmets and were treated for non-life threatening injuries. Anyone with information should contact the San Jose Police Department's Traffic Investigations Unit at 408-277-4654. Persons wishing to remain anonymous may either call the Crime Stoppers Tip Line, 408-947-STOP (7867). Persons providing information leading to the arrest and conviction of the suspect may be eligible for a cash reward from the Silicon Valley Crime Stoppers.